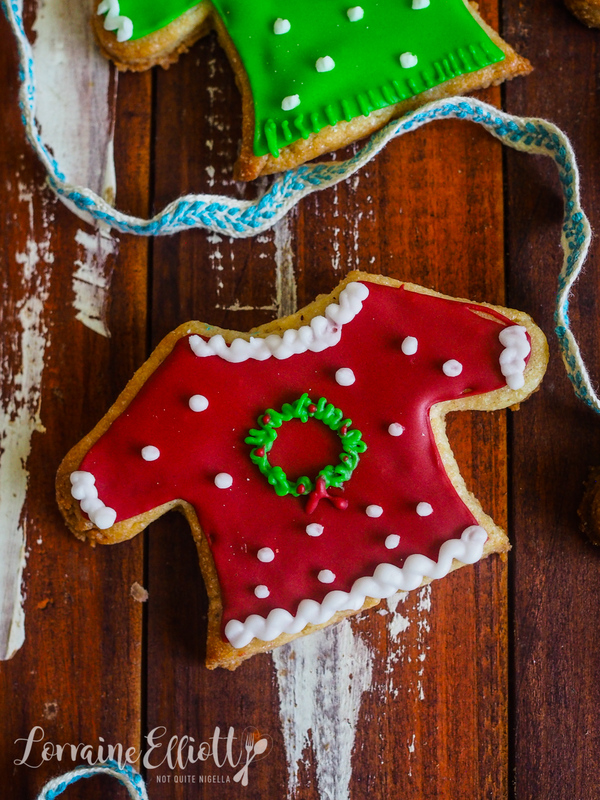 Fleece Navidad: Christmas Sweater Cookies! Merry (almost) Christmas Dear Reader! 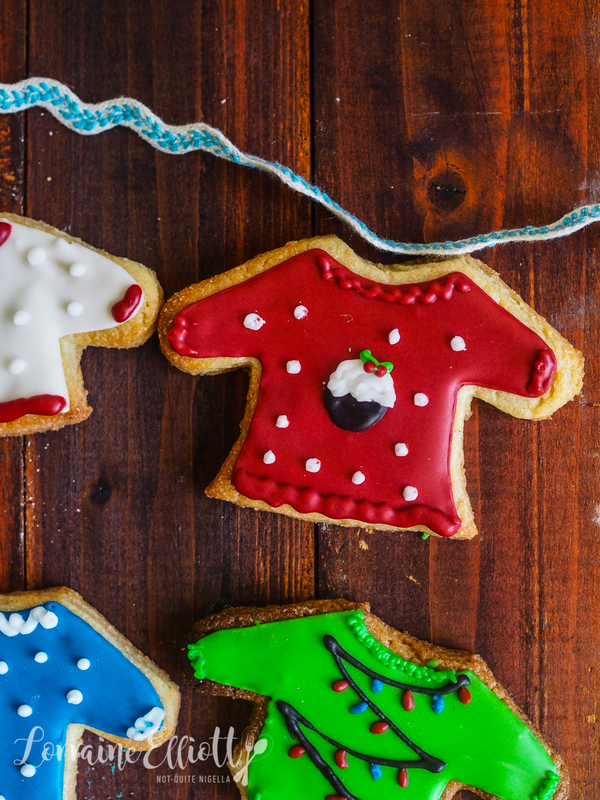 It's not Christmas until someone dons a Christmas sweater or at least eats a Christmas sweater cookie! 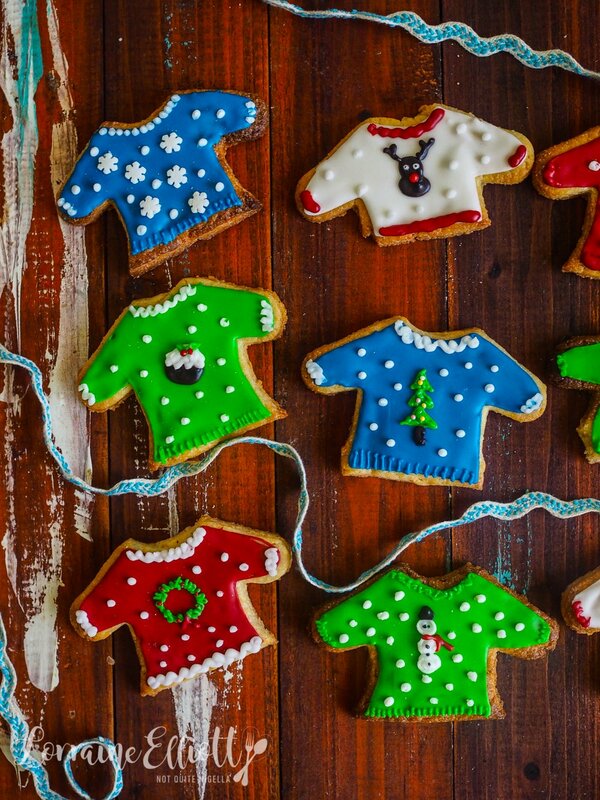 These sweet little sugar cookies are patterned with festive cheer. 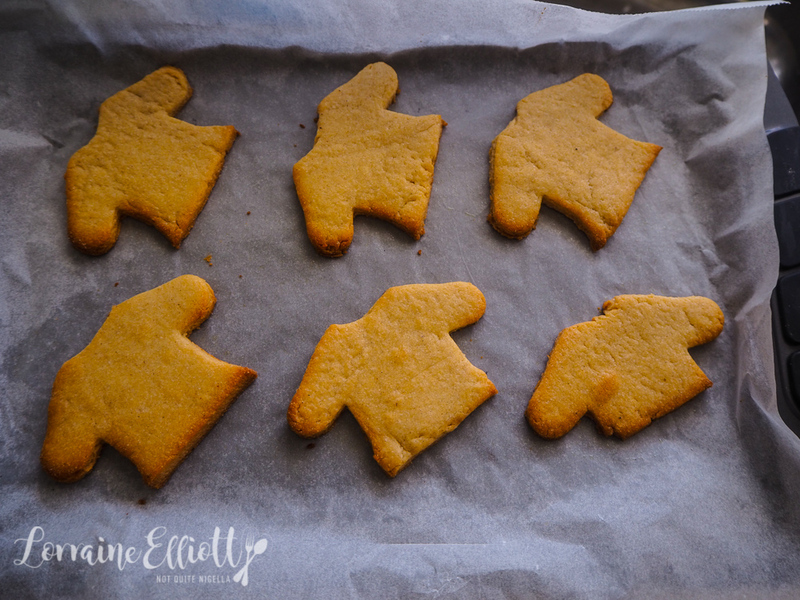 They're also easy to do and I show you how to make them! Dear Reader, I was frustrated a week or so ago. 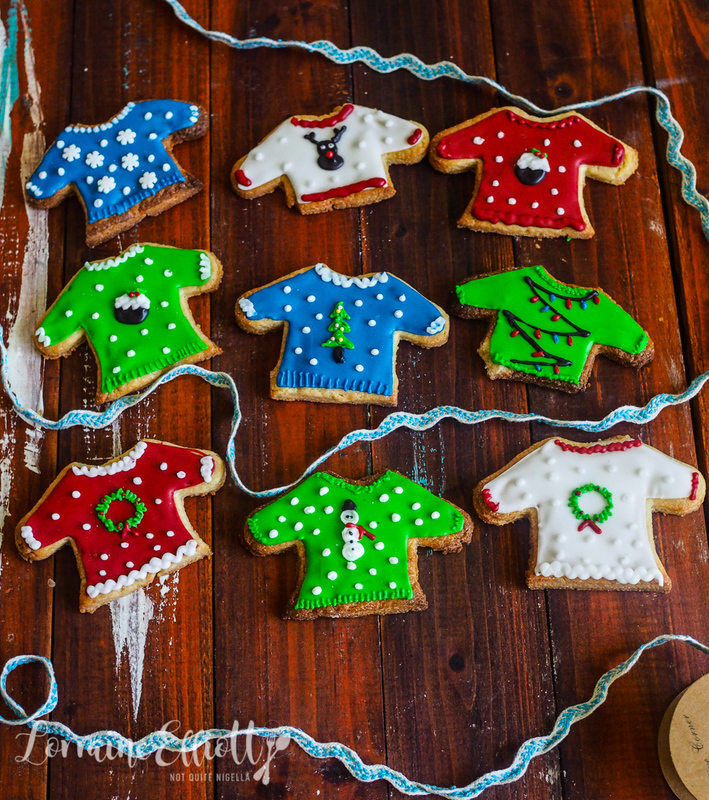 I wanted to make these Christmas jumper cookies but I didn't have a sweater cookie cutter. I rang around to my local cake decorating supply store and they didn't have any and while I saw some online, I didn't want to pay $9 to ship it to me especially since the cutter was $4 nor did I want to spend $30 to get free shipping. It was then that a lady that I rang suggested using a gingerbread man cookie cutter. Genius! 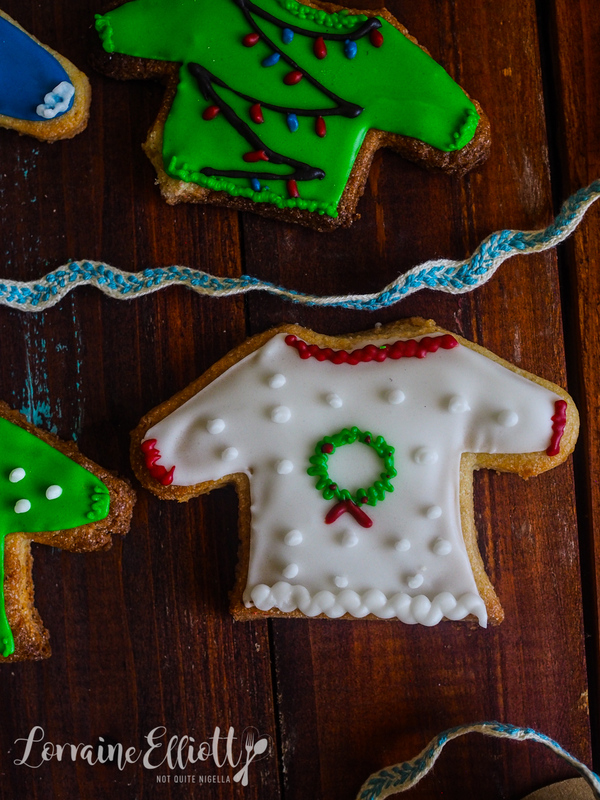 These cookies can be fiddly when it comes to decorating them but they're not difficult. 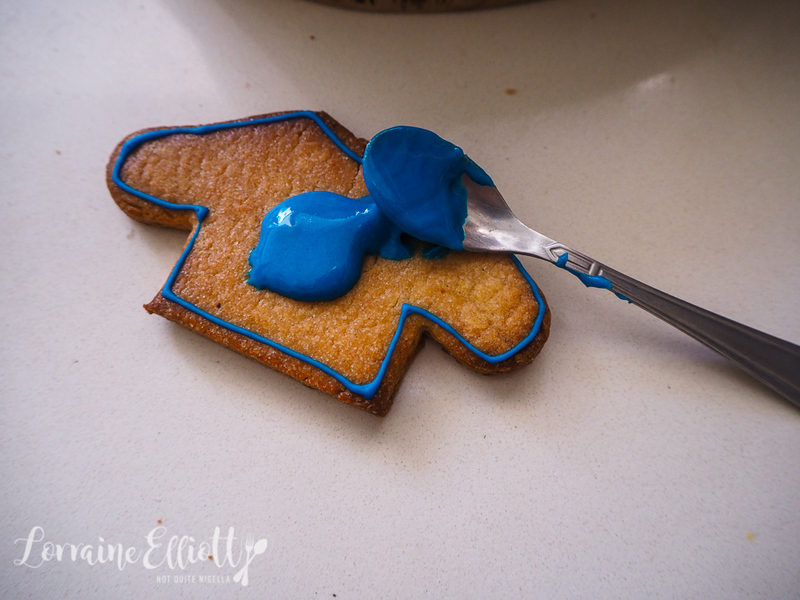 They come together with just a few colours too so if you're wanting to tackle royal icing cookies definitely give these a go. 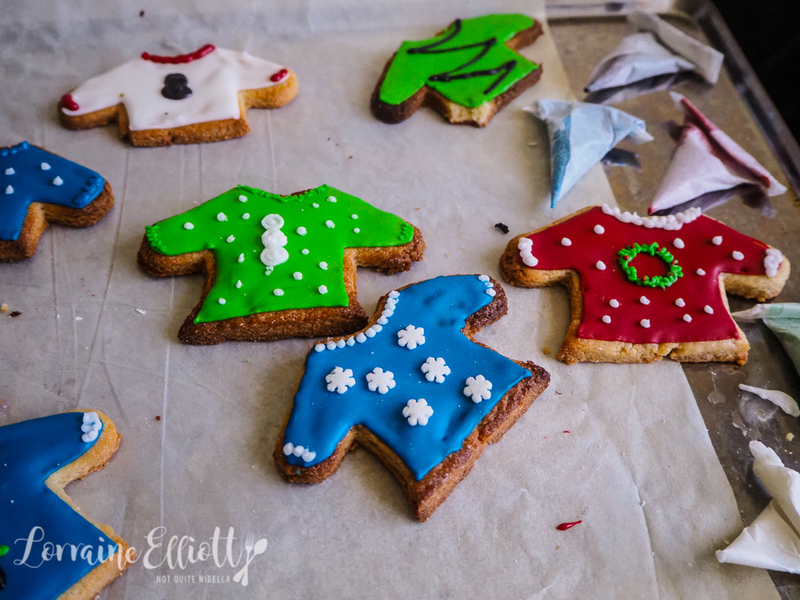 I find decorating cookies relaxing and I loved doing different cookie decorations. You could of course make them all the same and they'll still be fun but it's amazing how many patterns you can make using just a few colours. I've been getting into the Christmas spirit with it being less than a week away. We've started a Christmas tradition of an annual Mochi Santa photo. She's so good wearing clothing and so patient with us fussing over her so I knew she wouldn't mind. If last year taught us anything, it was that we should get there early so we headed to the Santa chair early one Sunday morning. 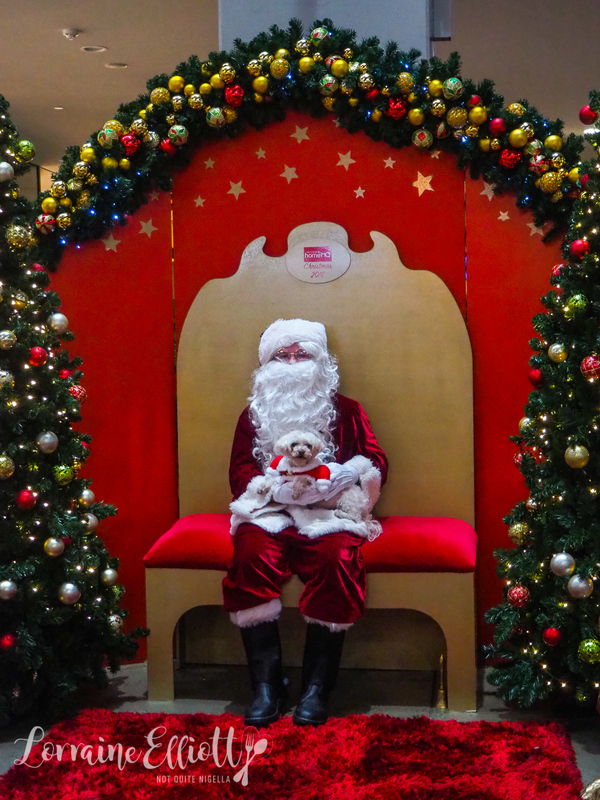 Not all Santas allow for pet photography (although this one did specify no lizards haha!) so it was nice to be able to take her one. The line had lots of dogs and Mochi made friends with some of them. We managed to get a pic of her in record time. The photographer marvelled that she pretty much looked straight at the camera the whole time and was so easy to photograph (listen to me, I'm a total stage mum!). And then we ran some errands, had lunch I got home and baked these cookies. I've also been rather addicted to a podcast and Dear Reader, I'm almost positive that you may have heard of it. It's called The Teacher's Pet by journalist Hedley Thomas and it's about a cold case in Australia. It's a true crime podcast about a woman called Lyn Dawson who went missing in 1982 and is about the twisted relationship between Lyn, her husband Chris and his live in student girlfriend Joanne. It is an incredible story about entitlement, boy's clubs, sexual abuse by teachers, gross incompetence and without spoiling anything, it is a true crime podcast with an ending. I have been so glued to it I've been listening to it before bed and when I wake up. It's also an excellent soundtrack to cooking as I decorated these cookies at the dining table listening to this with little Mochi at my feet! 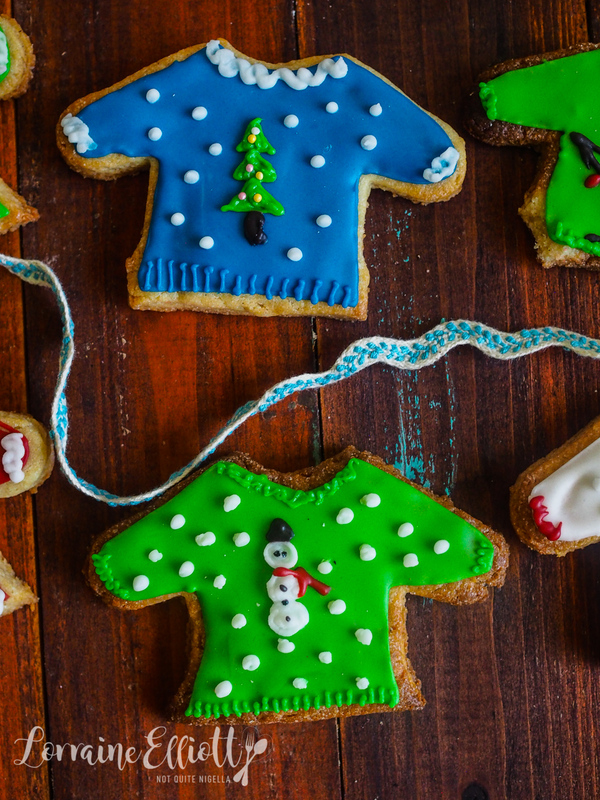 So tell me Dear Reader, do you have a Christmas sweater? And have you listened to The Teacher's Pet and what did you think of it? Do you have any other podcast recommendations for the holidays? Step 1 - In an electric mixer beat the butter and sugar together until pale (about 4 minutes). Add the egg and vanilla and beat until combined. On slow speed or by hand add the flour and mix until just combined. Roll the dough out between two sheets of parchment and refrigerate for 1 hour. 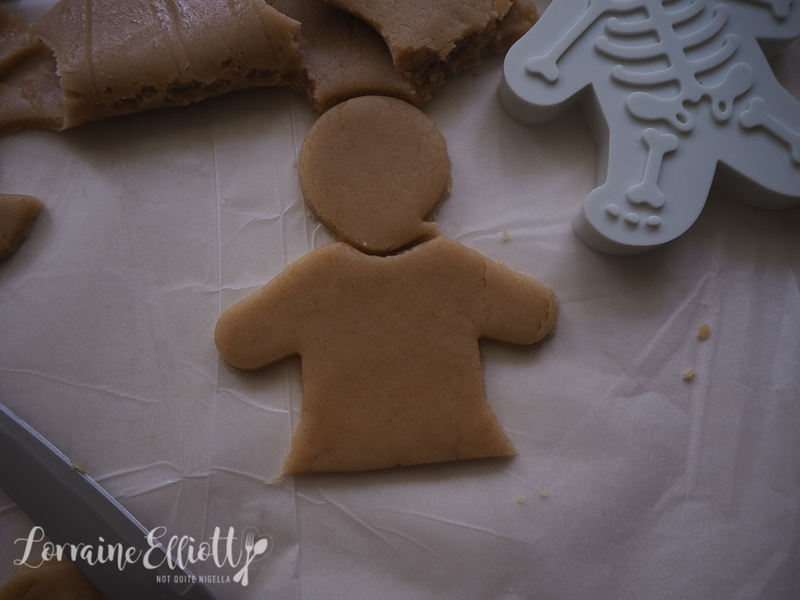 Step 2 - Cut out either using a sweater cutter or using a gingerbread cutter trimming the head and legs off. Bake at 200C/400F for 10 minutes or until golden and baked. Cool completely. Step 3 - Make the royal icing. 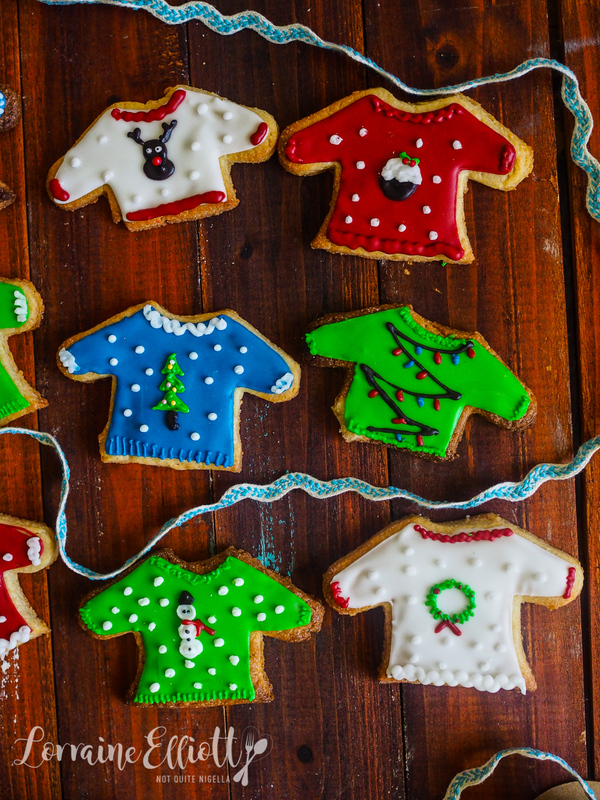 Place the icing sugar in a food processor and process until all lumps disappear. Add in the egg white-you want the icing to be stiffish and pipeable so add more icing sugar if needed or a sparing drop of water or lemon juice if it is too stiff. Divide the royal icing into five bowls and tint red, green, blue and brown or black and leave one white. 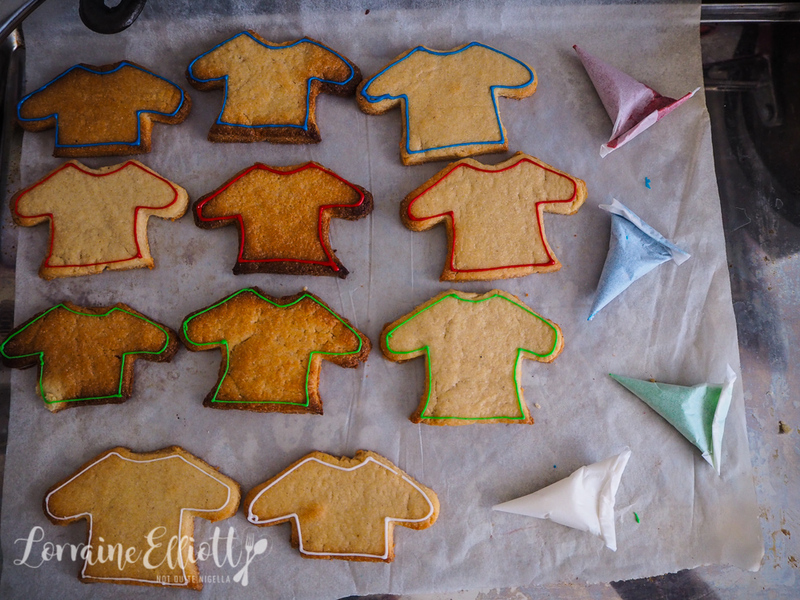 Step 4 - Place a couple of teaspoons of all 5 colours into piping bags (see how to make these piping bags here). 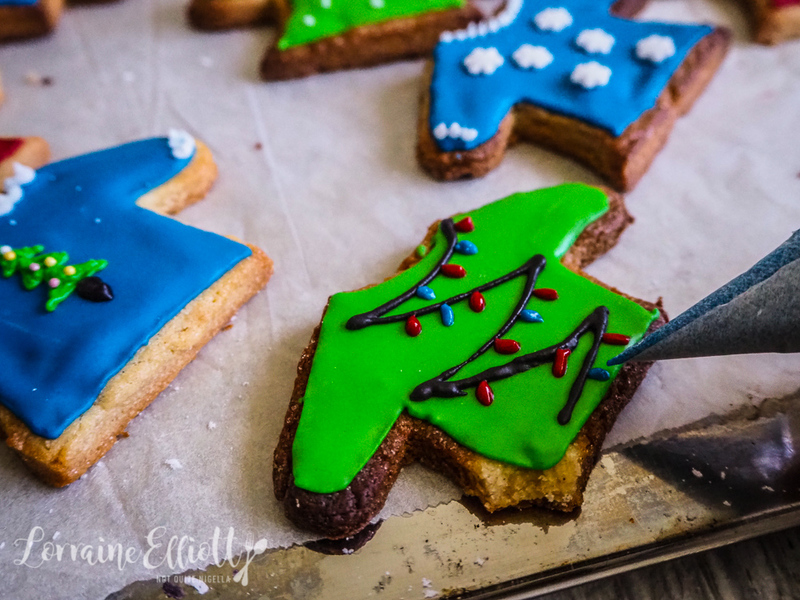 Pipe an outline around each cookie in blue, red, green and white stiff icing. Wait until set and then add a couple of tiny drops of water to the remaining bowls of royal icing and then "flood" the cookie and allow to set (may take a few hours). Step 5 - Decorate any way that you like-I made reindeers, Christmas trees, Xmas pudding, snowmen and Christmas lights. Set completely. recipeChewy, Crunchy, Crisp & Soft: 8 Christmas Cookies Using 1 Cookie Recipe! 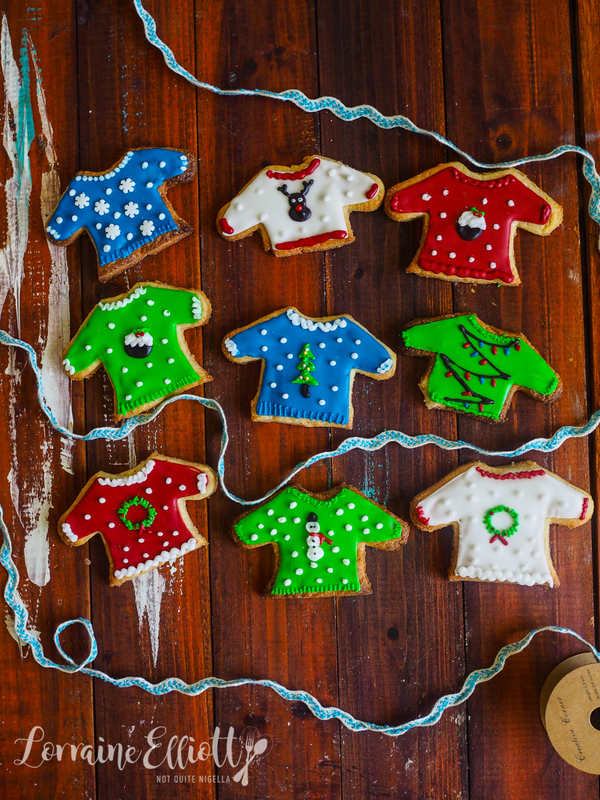 recipe Chewy, Crunchy, Crisp & Soft: 8 Christmas Cookies Using 1 Cookie Recipe!